Our fuel efficient delivery fleet is ready to bring Central Oregon’s best pizza hot and fresh to your home or office. (541) 330-9093 to place your order. Check out our MENU before you call. Be ready with your delivery address, closest cross street and phone number. After taking your order we will give you an estimated time of delivery. Although we usually meet or exceed our time estimates, sometimes unforeseen problems arise that may affect your delivery. We appreciate your patience and understanding. Please understand, we have a defined area of Bend that we deliver to. Sit back, relax & get ready to enjoy your pizza! For deliveries within our boundaries we require a minimum order of $20. Delivery charge is $2 or $3 (depending on location). Gratuities to your delivery driver are greatly appreciated. For very large orders and orders with specific time delivery requirements, advance notice is greatly appreciated. If you plan on paying with a credit card, please provide your card information when ordering. © 2019 Pizza Mondo Bend All Rights Reserved. 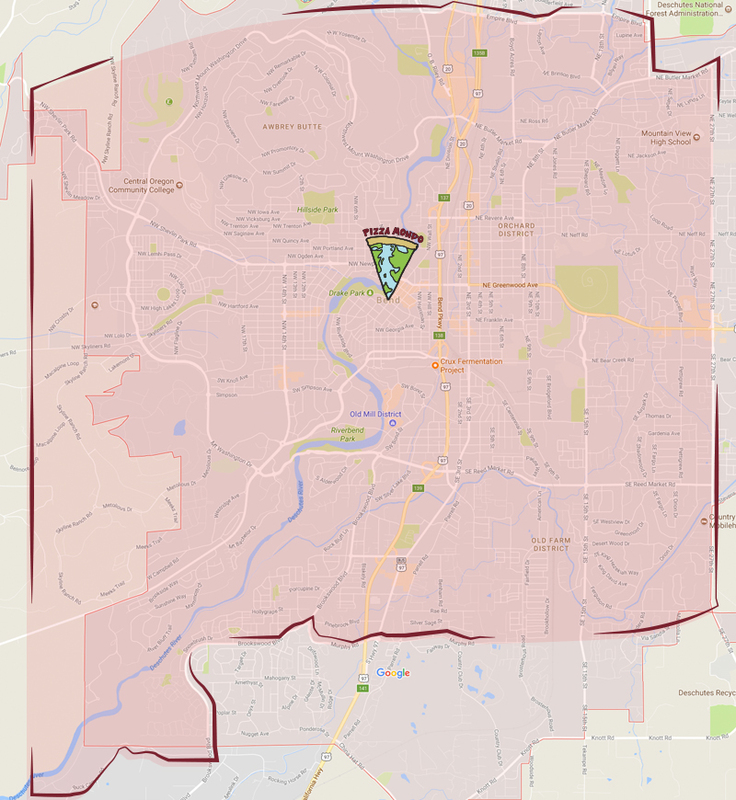 Call: 541-330-9093 or Visit: 811 NW Wall St | Downtown Bend, Oregon We Deliver!